Product Details-Ingredients- The food contains dried whole egg, high levels of Vitamins A, D3, E, B1, B2, C, minerals, and key amino acids. Suitable- Parrots - Conures.Quantity-400 Gm. 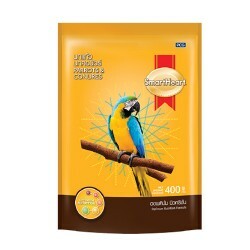 Product Information-Specifically developed to provide complete and balanced nutrition for Parrots, Conures and other related species for optimum growth. important in improving your birds overall nutritional needs from growing to breeding. The formulation also intensifies the feather radiant color. Dried Egg Yolk Source of high quality protein and rich in essential amino acids. Vitamin A-Improves visual acuity. Vitamin B1 - B2-Nourishment for the nervous system. Vitamin D3-Helps in the development of strong bones. Vitamin E-Aids the reproductive system. Vitamin C-Strengthens the immune system and helps reduce stress. Omega 3 - Omega 6fatty acid Helps Improve brain function.